The use of AI in customer service operations has already made a noticeable impact in recent times, and according to a report published by Salesforce Research, we should expect to see those numbers continue to rise in the coming years. 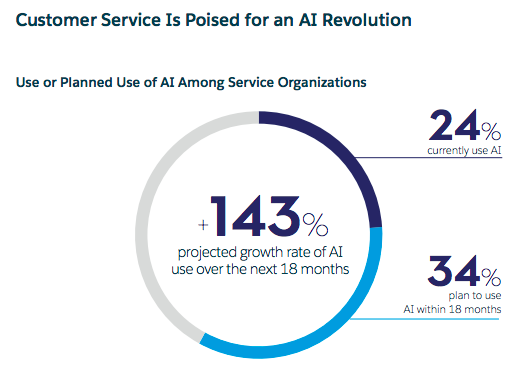 According to its report, which surveyed over 3,500 customer service agents and decision makers from across the globe, already 24 per cent of service organizations use AI in some manner, with 34 per cent of decision-makers surveyed saying they plan to implement AI in the next 18 months; which represents a projected 143 per cent increase over the next year and a half. 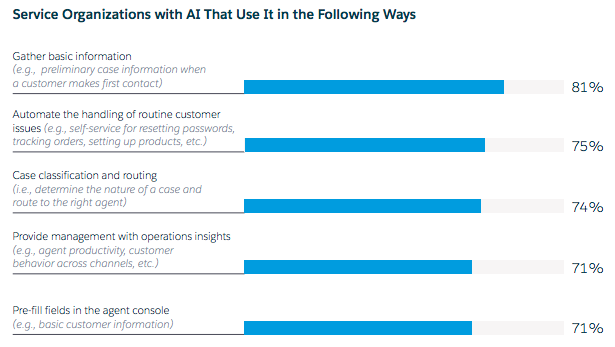 Additionally, of the service organizations surveyed, 56 per cent said they are actively looking for ways to introduce AI into its operations, and 39 per cent said they already have a fully outlined AI strategy in place, even if that strategy has not yet been put into practice. More specifically, when it comes to the use of AI chatbots, 23 per cent of decision-makers surveyed said they already use them, and 31 per cent plan to do so in the next 18 months; a 136 per cent increase. The most common implementations of AI already being used in the customer service industry are gathering basic information so that agents can be prepared for first contact (81 per cent), automation of basic customer inquiries like password resets or order tracking (75 per cent), determining the nature of the issue (74 per cent), and tracking of agent performance and customer behaviors (71 per cent). Despite all of these statistics, we should not expect AI to ever fully take over customer service channels, says the report. Of the service decision-makers who were surveyed, an overwhelming majority – 80 per cent – said that they do not believe the use of AI on its own is the best strategy, and instead say that a combination of AI and human service yields the best customer service performance.